Sailing on from the MEAC to the Big South. Hampton University is no longer a member of the MEAC. That’s common news in the HBCU sports community. Hampton now has a new coach as well. Former East Carolina defensive coordinator Robert Prunty is tasked with bringing Hampton up to speed in a new conference. Hampton’s pirate ship has sailed to the Big South and will now be looking to make a splash as it starts its new era. Hampton has six home games and only five road games. They’ll host Shaw, Tennessee State, Charleston Southern, Lane, Virginia of Lynchburg, and St.Andrews. The Pirates will travel to Monmouth, Northern Iowa, Presbyterian, SUNY Maritime, and Mississippi Valley State. Charleston Southern, Presbyterian, and Monmouth are the Big South foes within the schedule. Monmouth is a key game, as well as Northern Iowa, and Charleston Southern. All three teams have seen the FCS playoffs recently and are looking for a return back to the tournament. Hampton has an eclectic schedule with FCS, Division II, Division III, NCCAA, and NAIA opponents this year. That schedule came together late and controversially, but it is what it is, and there are some advantages to it. ps://hbcugameday.com/wp-content/uploads/2018/08/DSC_9157.jpg”> Classic matchups with MEAC teams won’t happen this year, but there is still plenty of HBCU on the schedule. Alabama A&M alumnus Robert Prunty is the new captain of the ship at Hampton. He has over 30 years of experience on the college and high school levels. Prunty served last season as East Carolina University’s associate head coach, defensive coordinator and defensive line coach. Prior to that, he served four years as the University of Cincinnati’s associate head coach and defensive ends coach and three years as co-defensive coordinator. Prunty spent three seasons before at Texas Tech, 2010-2012. Before that, he coached at the Hargrave Military Academy from 2002 to 2009. Of those coached, 27 of his former players went to the NFL from that school. Prunty is very well rounded and is looking to use his experience to help the Pirates program progress. 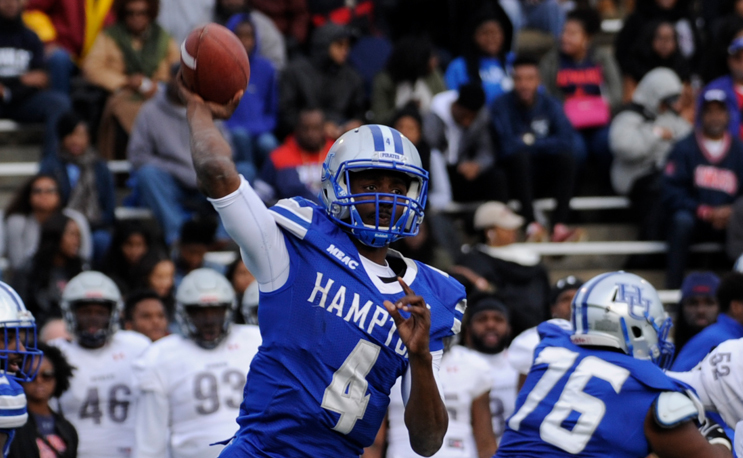 Quarterback Delmon Williams is at the helm for HU after a pretty solid season. He threw for 1,757 yards with 13 touchdowns last season. Shai McKenzie is expected to pick up the workload as Yahkee Johnson, Hampton’s leading rusher the past several seasons, has exhausted his eligibility. McKenzie ran for 489 yards and three touchdowns last season. Ronald Bell, HU’s leading receiver is back for the Pirates. He had 674 yards and seven touchdowns last season. Hampton lost its four leading tacklers from last season, so the defensive side of the ball will be the side that will have to progress the most. Ryan Anderson from East Carolina is tasked with putting together a powerful defense for Hampton. Hampton will be tested on the defensive side of the ball. We will see if the Pirates’ defense can rise to the occasion on both sides of the ball.